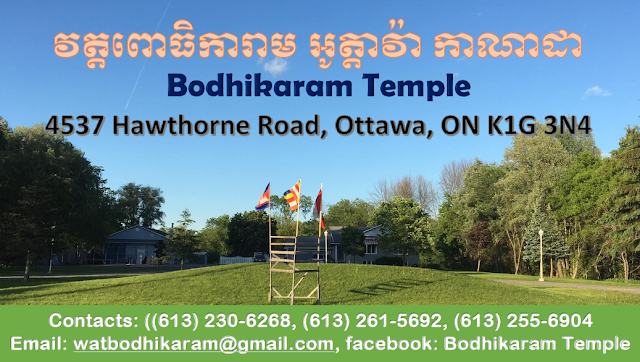 អាសយដ្ឋាន 4537 Hawthorne Road, Ottawa, ON K1G 3N4. -Friday Evening November 9, 2018 from 7:30 pm - 9:00 pm: Paying respect to the Triple Gem, taking the Five Precepts and the Monks Chanting the Paritta. -Saturday Morning, November 10, 2018 from 9:00am to 2:00pm: Paying respects to the Triple-Gem and taking the Five Precepts, Dhamma Lecture by a Monk, Putting alms in to alms-bowls, Food Offering to the Buddhist Monks, Blessing given by the Monks, Lunch of Monks, Processing Kathina requisites and Offer the Kathina robes to the Sangha (community of monks). 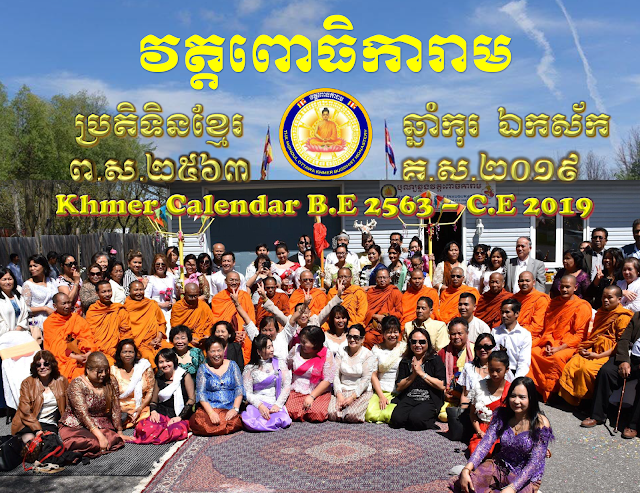 Please join us in order to preserve traditional Khmer Buddhism, and to perform the merit for your present and future life. May you be blessed by the Triple Gem! Thank you! Please come and join us in this ceremony in order to perform the merit for your present and future happy life. May peace and happiness be upon you and your family! Thank You!!! សូមគោរពអញ្ជើញពុទ្ធបរិស័ទជិតឆ្ងាយទាំងអស់ ចូលរួមអនុមោទនាបុណ្យចេញវស្សាដែល​នឹងប្រព្រឹត្តទៅនៅ វត្តពោធិការាម, អាសយដ្ឋាន 4537 Hawthorne Road, Ottawa, ON K1G 3N4. -Friday Evening, September 15, 2017 at 7:00pm to 9:00 pm, Paying respect to the Triple Gem, undertaking the Five Precept and invite the monks to chant paritta. -Saturday Morning, September 16, 2017 at 9:30am to 1:00pm, Paying respect to the Triple Gem, undertaking the Five Precepts, Dhamma Reflection by a monk, giving alms into the monk’s alms-bowls, offering food to the monks and dedicate merit to our ancestors. 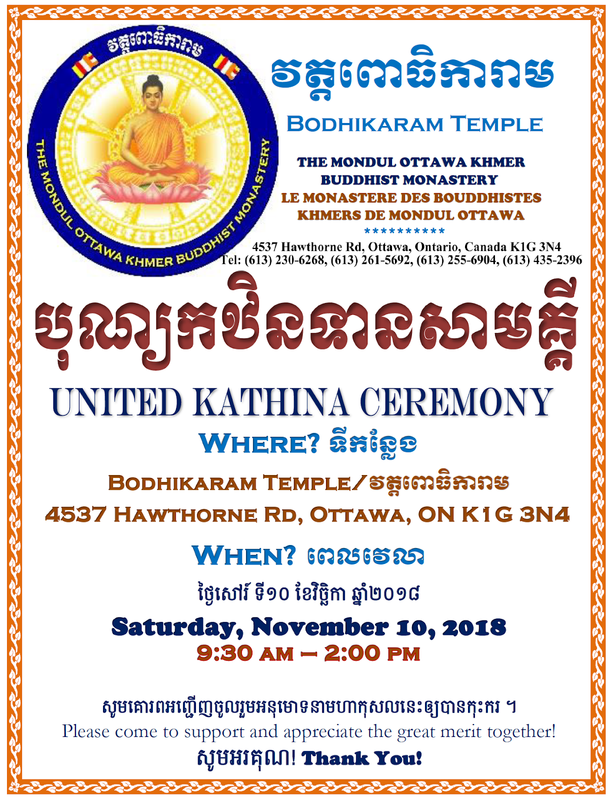 Please come to join this auspicious ceremony with us in order to preserve Khmer Buddhist culture, to share the merit with our ancestors and late relatives as well as to cultivate our own merit. May you be blessed with peace and happiness! What is Kan Ben Ceremony? Kan Ben ceremony or festival is the traditional Ceremony of the Cambodian Buddhism that our ancestors have been observing for generations as the worthy heritage to the next generation. Our forefathers defined this ceremony from the 1st to 14th day of waning moon in the 10th lunar month, the month Bhadrapada (usually falls in September) as Kan Ben ceremony and the 15th day of waning moon as Phchum Ben (Khmer Ancestor’ Day or Festival of the hungry ghost). These 15 days are called Phchum’s Season (Rodov Pchum) which is held every year. It is believed that during this time the guardians of hell release all hungry ghosts to come to earth to appreciate the merit of their relatives who bring foods, fruits and other requisites to offer the monks in the temple and dedicate merit to them. After the hungry ghosts appreciate the merit that their relatives dedicate to them, they are no longer hungry ghosts in the suffering realm, but they turn to be heavenly beings living in Heaven. With gratitude, they bless their relatives who have accumulated good karma on their behalf and wish them happiness and prosperity. That is why our forefathers have been holding this ceremony from the ancient time until now. Each Kan Ben’s Day people gathering as a family or group taking turn bringing food and requisites to the temple to offer to the monks and dedicate merit to their ancestors and late relatives. On Pchum Ben Day, people all groups and family come to the temple to celebrate it together. In 2017, the Kan Ben Day will be started from September 6 to September 19, and September 20 is the exact Pchum Ben’s Day. 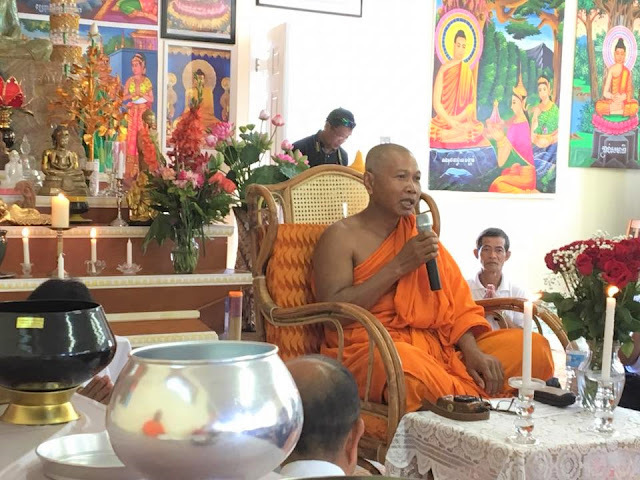 Under the circumstance that we can hold the event only in the weekend to give people the time to come and celebrate together, Bodhikaram temple will start Kan Ben from September 6 to September 19, except on September 16 we don’t have Kan Ben Day, but celebrate Pchum Ben Ceremony together. 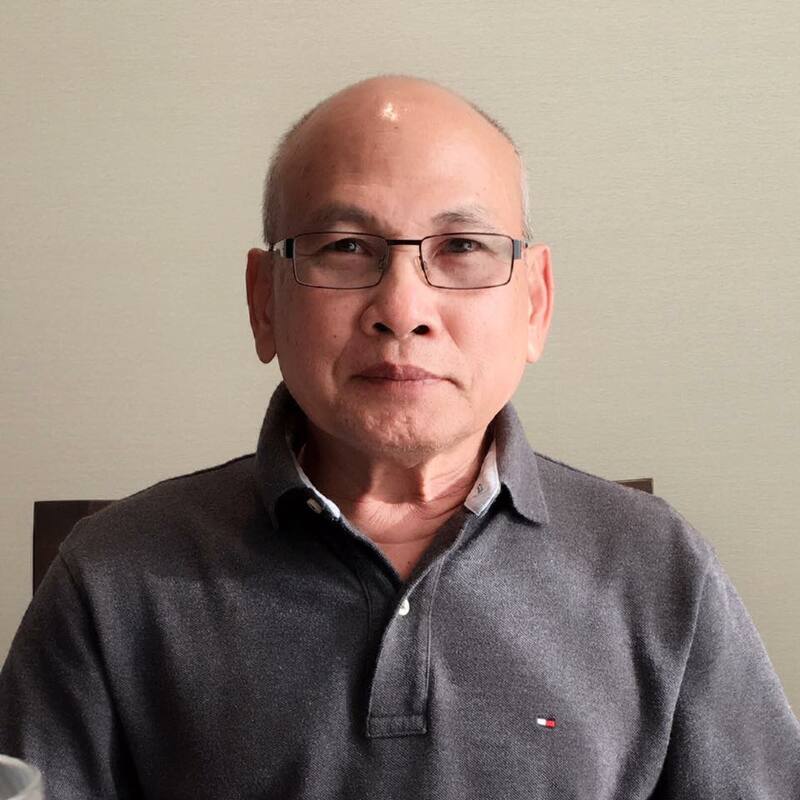 We would like to invite you, your family and group to take turn for Kan Ben (Kan Ven Ben) any of your available day from September 6 to September 15 and come to celebrate Pchum Ben Day together on September 16 and then we continue the Kan Ben’s day until September 19. If you are available on September 20, please come to celebrate the exact Pchum Ben day again. Thank you for helping us to preserve Buddhist Culture for the sake of all beings. សូមពុទ្ធបរិស័ទ សប្បុរសជនទាំងអស់ជួយចូលរួមទទួលវេនកាន់បិណ្ឌ និង ភ្ជុំបិណ្ឌឲ្យបានកុះករ ដើម្បីឧទ្ទិសផ្សាយកុសលផលបុណ្យជីដូនជីតាបុព្វការីជននិងញាតិកាទាំង៧សន្តានផង និងជាកុសលផ្តល់នូវសេចក្តីសុខចម្រើនដល់ខ្លួន និងក្រុមគ្រួសារផង។ សូមសេចក្តីសុខចម្រើនកើតមានដល់សាធុជនគ្រប់រូបសព្វៗកាល! សូមគោរពអញ្ជើញពុទ្ធបរិស័ទញាតិមិត្តជិតឆ្ងាយទាំងអស់ចូលរួមអនុមោទនាបុណ្យបំបួសកុលបុត្រ និងបុណ្យសង្ឃបូជា។ សូមជម្រាបថា លោក អឿ សម្បត្តិ និង លោក ហេង សំអាត មានសទ្ធាជ្រះថ្លាចូលបព្វជ្ជា(បួស) ក្នុងព្រះពុទ្ធសាសនា។ ពិធីបុណ្យនឹងប្រព្រឹត្តទៅនៅវត្តពោធិការាម ទីក្រុងអូត្តាវ៉ា 4537 Hawthorne Road, Ottawa, ON K1G 3N4. -ព្រឹកថ្ងៃសៅរ៍ ទី១២ ខែ៨ ចាប់ពីម៉ោង ៩:30ព្រឹក ធ្វើសាសនកិច្ចផ្សេងៗ និងម៉ោង ១ រសៀលចាប់ផ្តើមបំបួសកុលបុត្រ។ សូមអញ្ជើញចូលរួមអនុមោទនាមហាកុសលនេះឲ្យបានកុះករ។ សូមអរគុណ! 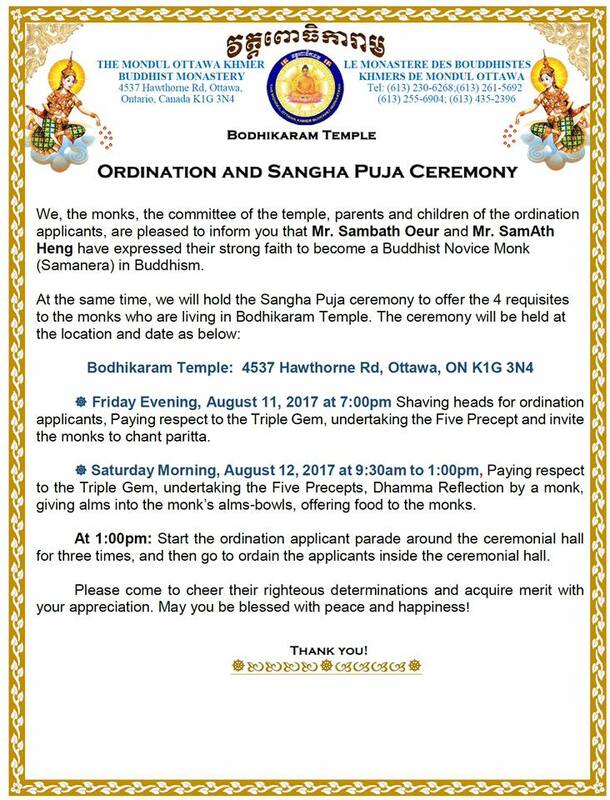 You are invited in join the ordination ceremony and the ceremony of Sangha Puja. Please be informed that Mr. Oeur, Sambath and Mr. Heng, SamAth will become Buddhist Novice Monks. 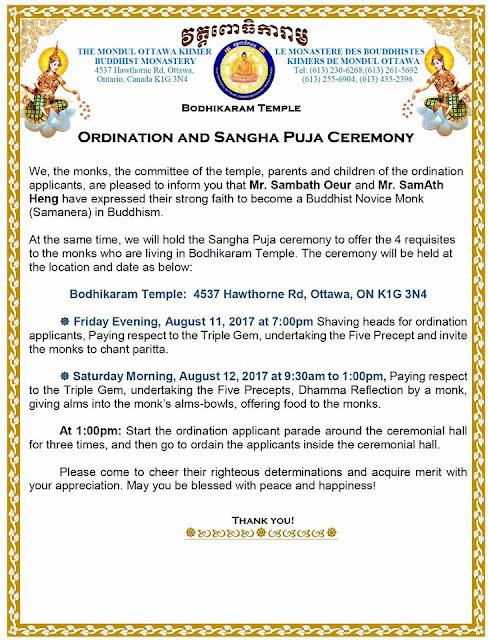 The ordination ceremony will be held at Bodhikaram Temple 4537 Hawthorne Road, Ottawa, ON K1G 3N4. Please come to participate in this auspicious ceremony with us. Thank you! 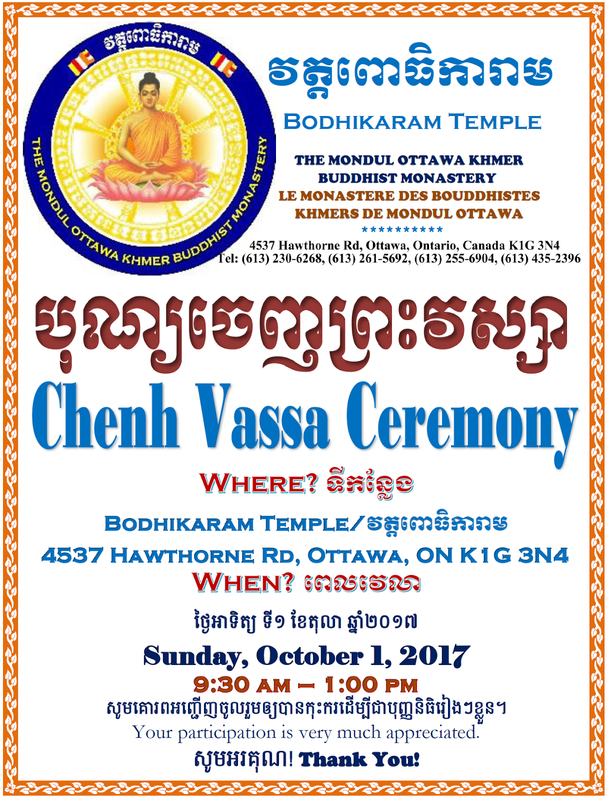 We, The Board of Directors of Bodhikaram Temple, the Mondul Ottawa Khmer Buddhist Monastery, would like to inform you that we will organize the End of Buddhist Lent ceremony (Bonn Chenh Vassa) on Sunday Morning, October 25, 2015 in Bodhikaram Temple at 1197 Deer​Park Road, Ottawa, ON, K2E 6H5 starting from 9:00 am to 12:00 pm. You are invited to attend and appreciate this meritorious act for the own happiness in this very life and the next as well as to transfer the merit to your departed ones. Your participation is very much appreciated. May you be blessed with peace and happiness! Arrival of guests, Paying respect to the Triple Gem, taking the Five Precepts and the Monks Chanting the Paritta. 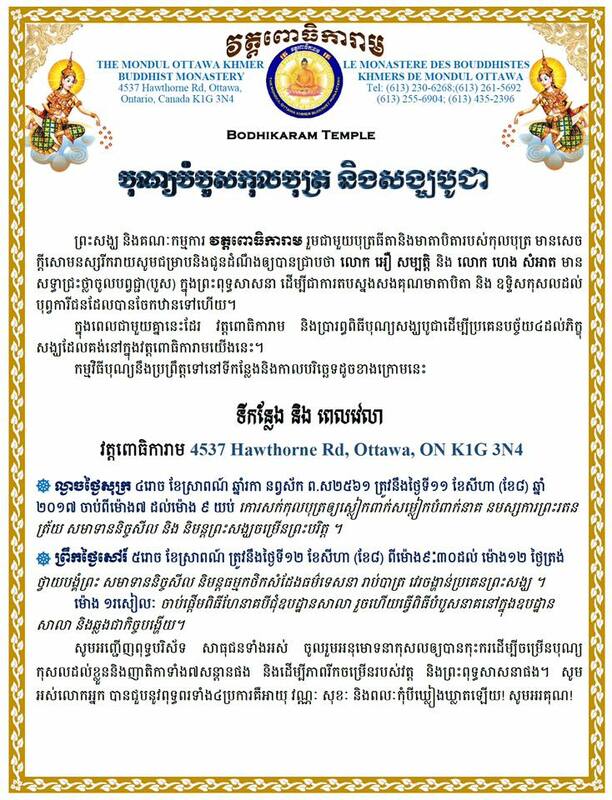 Please join us in order to preserve traditional Khmer Buddhism, and to perform the merit for your present and future life. May you be blessed by the Triple Gem! Magha Puja is organized to commemorate two important events on full moon day of the month Magha (Lunar calendar) in the Buddha’s life, i.e. The Fourfold Assembly and The Rejection to the aggregates of life. 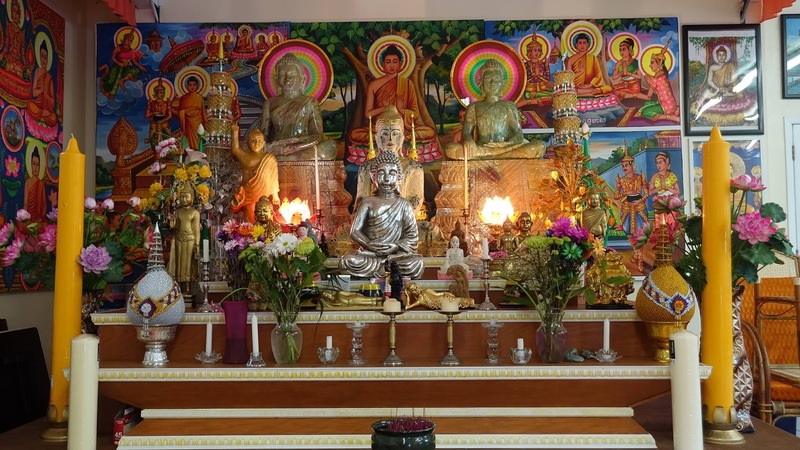 Paying Respect to the Triple Gem and Undertake the Five Precepts, Invite the Monks to chant Paritta, Perform the devotional acts and offer the fragrant material offerings to the Buddha, monks and layfollowers recite the Khmer Buddhist hymn of the Buddha's life. Today Buddhism remains as a great civilizing force in the modern world. As a civilizing force, Buddhism awakens the self-respect and feeling of self-responsibility of countless people and stirs up the energy of many a nation. It fosters spiritual progress by appealing to the thinking powers of human beings. It promotes in people the sense of tolerance by remaining free from religious and national narrowness and fanaticism. It tames the wild and refines the citizens to be clear and sober in mind. In short, Buddhism produces the feeling of self-reliance by teaching that the whole destiny of humanity lies in their own hands, and that they themselves possess the faculty of developing their own energy and insight in order to reach the highest goal. For over two thousand years, Buddhism has satisfied the spiritual needs of nearly one-fifth of mankind. Today the appeal of Buddhism is as strong as ever. The Teachings of the Buddha remain among the richest spiritual resources of mankind because they lift the horizon of human effort to a higher level beyond a mere dedication to man’s insatiable needs and appetites. Owing to its breadth of per­spective, the Buddha’s vision of life has a tendency to attract intellectuals who have exhausted their individual quest for meaning. However, the fruit of the Buddha’s vision is something more than intellectual gymnastics or solace for the intellectually effete. Buddhism does not encourage verbal speculation and argument for its own sake. Buddhism is practical, rational and offers a realistic view of life and of the world. It does not entice people into living in a fool’s paradise, nor does it frighten and agonize people with all kinds of imaginary fears and guilt-feelings. It does not create religious fanatics to disturb the followers of other religions. The Buddhist attitude to other religions is remarkable. Instead of converting the followers of other religions into Buddhism, Buddhists can encourage them to practise their own religions because Buddhists never think the followers of other religions are bad people. Buddhism tells us exactly and objectively what we are and what the world around us is, and shows us the way to perfect freedom, peace, tranquility and happiness. If humanity today is to be saved from reacting against the moral standards taught by religions, Buddhism is a most effective vehicle. 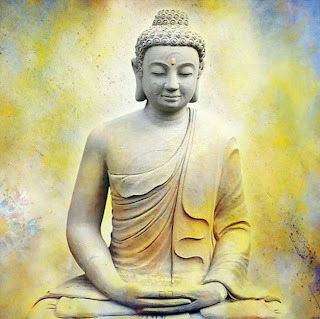 Buddhism is the religion of humanity, whose founder was a human being who sought no divine revelation or intervention in the formulation of His Teachings. In an age when human beings are overwhelmed by their success in the control of the material universe, they might like to look back and take stock of the achievements they have made in controlling the most difficult of all phenomena: their own selves. It is in this quest that the modern human beings will find in Buddhism an answer to their numerous problems and doubts. Today, Buddhism appeals to the West because it has no dogmas, and it satisfies both the reason and the heart alike. It insists on self-reliance coupled with tolerance for others. It embraces modern scientific discoveries if they are for constructive purposes. Buddhism points to man alone as the creator of his present life and as the sole designer of his own destiny. Such is the nature of Buddhism. This is why many modern thinkers who are not themselves Buddhist have described Buddhism as a religion of freedom and reason. The Buddha’s message of peace and compassion radiated in all directions and the millions who came under its influence adopted it very readily as a new way of religious life. -10:30 am: Dhamma Lecture given by the monk. -11:30 am: Blessing given by the monks, Lunch of monks. He spent the remainder of his life wandering from place to place teaching his discoveries. Typical activities would include: Going to temple for special observances and listening to Dhamma teaching, giving food to the Monks, and Keeping the Five or Eight precepts. The way of celebrating Visakha Puja is similar to the celebration of Magha Puja. May peace and happiness be upon you and all beings in the universe! This ceremony marks two important dates in the life of Buddha. The first event occurred two years after Buddha’s enlightenment and is referred to as the Fourfold assembly. 1-All 1,250 monks had achieved enlightenment. 3-The monks assembled on their own without being called together. 4-It was a perfect full-moon day. All of these occurred on full moon day of the third lunar month. 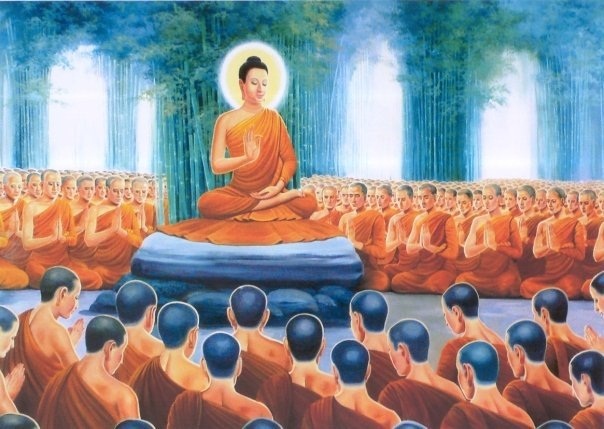 As part of this gathering Buddha gave the basic principles of Buddhism to the monks, called the 'Ovādapātimokha' in the afternoon of Magha Puja day, at the grand temple Veluvana (Bamboo Grove) in the city of Rajgaha. 3-To cleanse the mind of impurities. If everyone followed these principles we would have a peaceful family, peaceful community, peaceful nation, and peaceful world. Or put another way, we would have peaceful and happy lives. 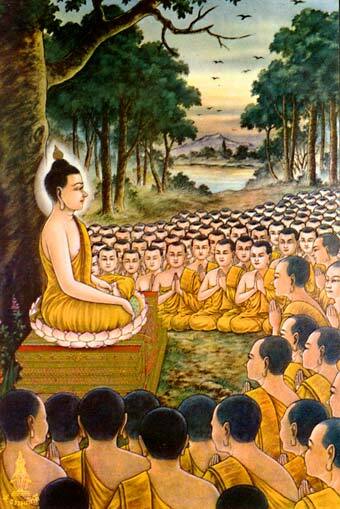 The second event occurred in the second half of Buddha’s life on Magha Puja Day. The Buddha delivered a sermon called "Keys for success". The second event was three months prior to his passing away and it’s also said that on the same day of giving sermon called “Keys for success”, the Buddha declared that he would pass away in three months time. 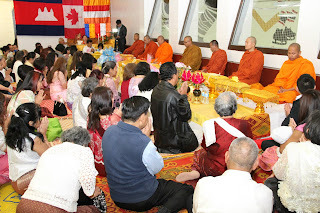 During this ceremony lay people focus more intensely on Dhamma and meditation. 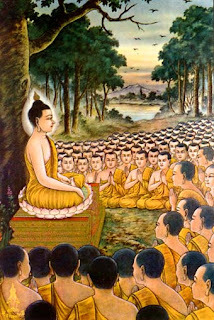 Dhamma (or Dharma) as it is sometimes referred to is the teachings of Buddha. Lay people would typically take vows to refrain from bad habits and perform acts to benefit them spiritually. Cambodian people recognize this opportunity to perform merit-makings. In the morning, they prepare and offer food to monks. Elderly people take this opportunity to practice Dhama, paying, concentration and purifying minds. Some of them even stay at the temple overnight. In the evening, every temple is readily prepared for candle procession to take place. Just after 6.00 or 7:00 p.m., monks and novices come to the major temple building, so called 'Preah Vihear'. Chief monk lead the pray . People readily assemble and prepare flowers, joss sticks and candles to perform the devotional acts. Magha Puja is the day that Buddhists are to make merits, to perform candle processions to maintain religious commandment to practice Dhama and to Pay Respect to the Lord Buddha. These are main Buddhist doctrines. May peace and happiness be upon to Cambodian and all beings in the universe! 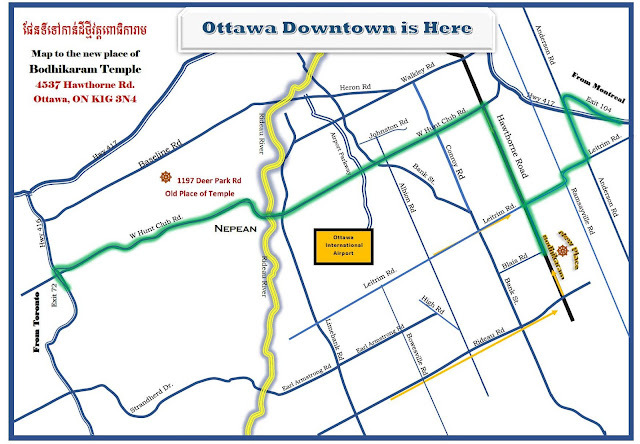 9:00 am : Arrival of guests. 9:30 am : Paying respects to the Triple-Gem and taking the Five Precepts. 10:00 am : Putting alms in to alms-bowls, Food Offering to the Buddhist Monks. 11:30 am : Blessing given by the Monks, Lunch of Monks, Dhamma Lecture by a Monk. 12:00 am : Communal Lunch. Your participation is our honor and much appreciated. May peace and happiness be with you! 9:30 am: Paying respects to the Triple Gem and taking the Five Precepts. 10:00 am: Putting alms into alms-bowl, Food offering to th Buddhist Monks. 11:30 am: Blessing given by the monks, Lunch of monks, Dhamma Lecture. Please come and join us in order to perform the merit for your present and future happy life. May peace and happiness be upon you and your family! Location: 1065 Foster Farm Ramsey Cress. 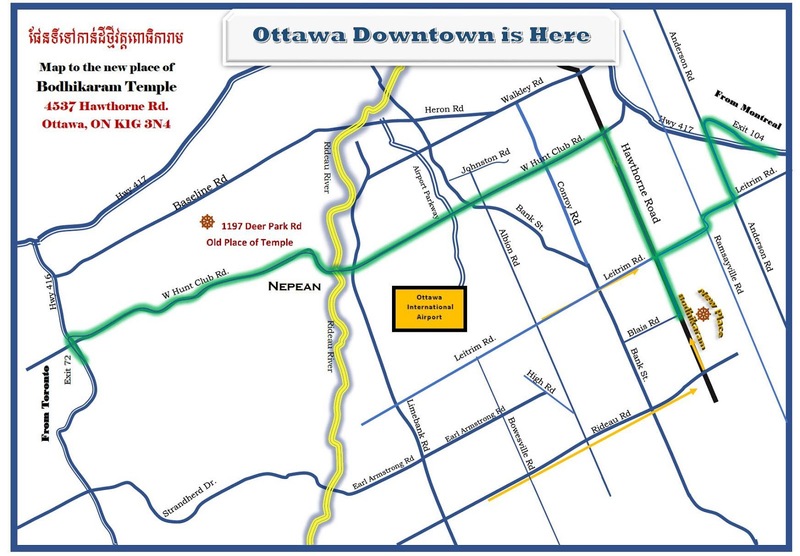 Ottawa, Ontario, Canada. 9:30 am : Paying respects to the Triple Gem and taking the Five Precepts. 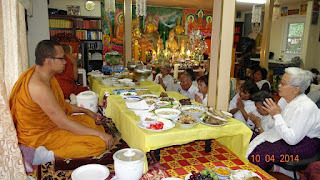 10:00 am : Putting alms into alms-bowl, Food offering to th Buddhist Monks. Transferring merits to our ancestors. Please come and join us in order to preserve our Buddhism, Khmer Culture and to perform the merit for your present and future happy life. May peace and happiness be upon you and your family! Magha Puja Day falls on the full moon day of the second or third lunar month(late February or early March). 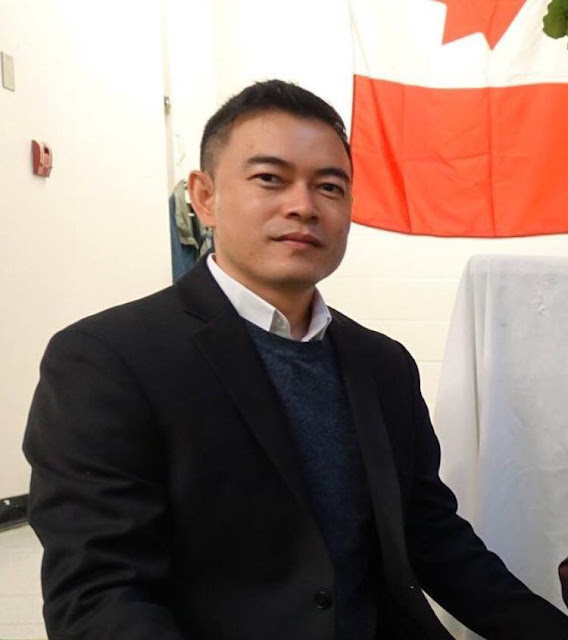 The date of all of the Cambodian festivals is based on the lunar calendar so the "Canadian" dates vary from year to year. 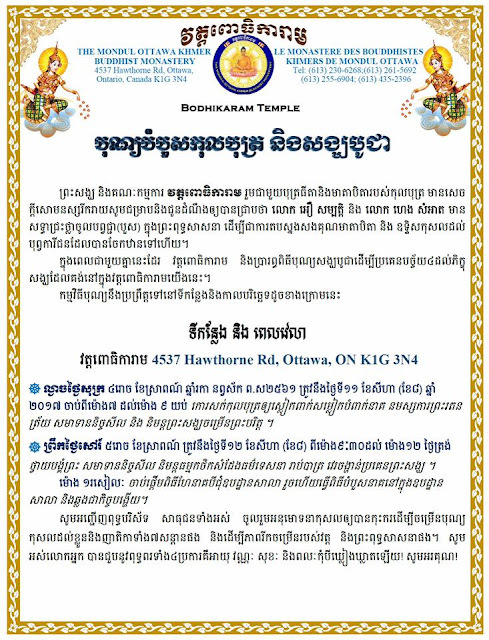 We will be celebrating Magha Puja Day at Wat Bodhikaram, the Mondul Ottawa Khmer Buddhist Monastery, on February 19, 2011 start from 9:00 am to 2:00 pm. On Magha Puja day, Cambodian people recognize this opportunity to perform merit-makings. In the morning, they prepare and offer food to monks. Elderly people take this opportunity to practice Dhama, paying, concentration and purifying minds. Some of them even stay at the temple overnight. In the evening, every temple is readily prepared for candle procession to take place. Just after 6.00 or 7:00 p.m., monks and novices come to the major temple building, so called 'Preah Vihear'. Chief monk lead the pray and, indeed, Ovada Patimokha is unavoidable. People readily assemble and prepare flowers, joss sticks and candles. They wait until the pray is completed. Monks then lead people to perform a triple candlelight circumambulating around the Preah Vihear. After the candlelight procession, monks and lay Buddhists go back into Preah Vihear to recite the Buddhist Dhamma songs or do the Dhamma talk about the Life of the Buddha until 12:00 am, some temples even do this until the morning. This is an important Buddhist activity to remind the Lord Buddha's kindness that has taught everyone to avoid committing bad deed, to do only good and always purify one's mind. Magha Puja is an important day for all Cambodian. It is the day that Buddhists are to make merits, to perform candle processions to maintain religious commandment to practice Dhama and to Pay Respect to the Lord Buddha. These are main Buddhist doctrines.